Another good article from J. B. – on a software quality. 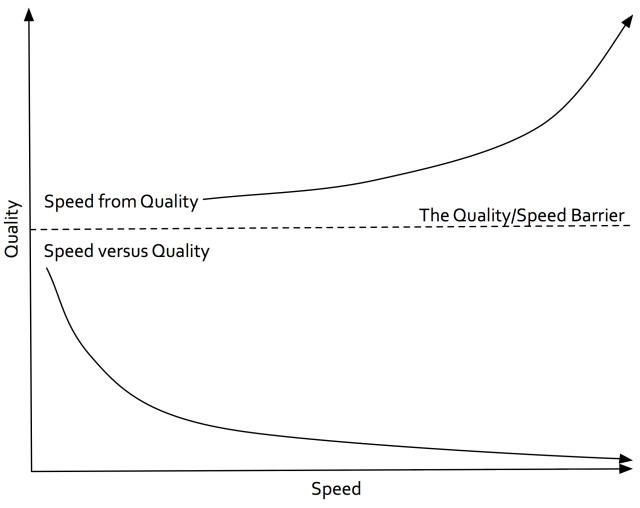 Similar to the Marxist Law of Transformation the development culture can reach a point at which driving forces behind quality/speed relation switch places: at first, rushing can hurt quality, but as soon as you’ve taken the barrier – increasing quality is able to speed up the development. I wouldn’t agree though with necessity of changing employers in order to grow – you can find a place for yourself to be the worst from time to time within same company. I think it is a struggle for any developer to balance the desire to keep pace with ever changing technology and to also be content within a position even if the technology of the company becomes stale. Personally my own philosophy as a developer has always been "stay current or die". I have seen the "cobal syndrome" in developers who have stayed at companies too long and it is a fate I do not wish to endure. Right, it must be a some kind of natural self-preservation instinct. The question is whether the company is able to recognize this notion and use it to its own benefit.